At the end of the 19th century, under the benevolent patronage of Kaiser Wilhelm II, Germany became home to new scientific and technological ideas. In German universities, innovators like Albert Einstein, Max Planck, Werner Heisenberg, Max Born, Erwin Schrödinger, Wolfgang Pauli and Walther Nernst revolutionized physics and chemistry with their theories of relativity, of the atomic structure and of the quanta. Walther Nernst, a founder of physical chemistry, received the Nobel prize in 1920 for his formulation of the third law of thermodynamics. He died in 1941 in Germany, disillusioned by Hitler’s destruction of German academic life. 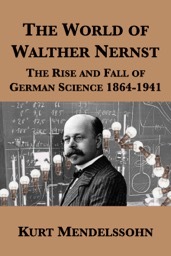 This biography of Walther Nernst, the author’s mentor, also provides an overview of German science and technology, from its stellar rise to its rapid fall when the Nazis came to power and the vast majority of German scientists went into exile to Britain (like the author), to the United States or elsewhere to continue the tradition and spirit of the scientific revolutions started in Germany’s institutions of higher learning.